Leonard attended Canyon Springs High School in Moreno Valley, California, before transferring to Martin Luther King High School his junior year. In Leonard's senior year, he and Tony Snell led the King High Wolves to a 30–3 record. Leonard averaged 22.6 points, 13.1 rebounds, 3.9 assists and 3.0 blocks per game that year and won California Mr. Basketball. Considered a four-star recruit by Rivals.com, Leonard was listed as the No. 8 small forward and the No. 48 player in the nation in 2009. As a freshman at San Diego State University in 2009–10, Leonard averaged 12.7 points and 9.9 rebounds per game for the Aztecs. He helped lead the Aztecs to a 25–9 record and the Mountain West Conference (MWC) tournament title. SDSU received an automatic bid to the NCAA Tournament but lost to Tennessee 62–59 in the first round, with Leonard recording 12 points and 10 rebounds. He led the MWC in rebounding and was named MWC freshman of the year, first team All-MWC, and the 2010 MWC Tournament MVP. In Leonard's sophomore season, he averaged 15.7 points and 10.4 rebounds as the Aztecs finished with a 34–3 record and won back-to-back conference tournament championships. Leonard and San Diego State would once again make the NCAA tournament. This time, SDSU would advance to the Sweet 16 where they lost to eventual national champion UConn. Leonard was named to the Second Team All-America and would forgo his final two seasons at San Diego State to enter the 2011 NBA draft. Leonard was selected with the 15th overall pick in the 2011 NBA draft by the Indiana Pacers but was traded that night to the San Antonio Spurs along with the rights to Erazem Lorbek and Dāvis Bertāns in exchange for George Hill. On December 10, 2011, following the conclusion of the NBA lockout, he signed a multi-year deal with the Spurs. Leonard and teammate Tiago Splitter were selected to play in the 2012 Rising Stars Challenge as members of Team Chuck. Although he suited up for the event, he did not play due to a calf strain. After starter Richard Jefferson was traded to the Golden State Warriors for Stephen Jackson, Leonard was promoted to the starting small forward position while Jackson served as his backup. At season's end, Leonard placed fourth in Rookie of the Year voting and was named to the 2012 NBA All-Rookie First Team. "I think he's going to be a star. And as time goes on, he’ll be the face of the Spurs, I think. At both ends of the court, he is really a special player. And what makes me be so confident about him is that he wants it so badly. He wants to be a good player, I mean a great player. He comes early, he stays late, and he's coachable. He's just like a sponge. When you consider he's only had [two years] of college and no training camp yet, you can see that he's going to be something else." In the summer of 2012, Leonard was among several NBA up-and-comers chosen to play for the 2012 USA men's basketball Select Team. They trained with the Olympic team which featured Kobe Bryant, LeBron James, Kevin Durant, Chris Paul, and others. On October 26, 2012, the Spurs exercised the team option on Leonard, re-signing him through the 2013–14 season. Leonard was selected to play for the BBVA Rising Stars Challenge where he was once again drafted to Team Chuck. He recorded 20 points and 7 rebounds as Team Chuck defeated Team Shaq for the second straight year 163–135. The San Antonio Spurs advanced to the NBA Finals where they faced the Miami Heat. Leonard averaged 14.6 points and 11.1 rebounds during the Finals as the Spurs lost the series in seven games. On April 6, 2014, Leonard scored a season-high 26 points in the Spurs' 112–92 win over the Memphis Grizzlies. He finished the season averaging 12.8 points, 6.2 rebounds, 2.0 assists, 1.7 steals while shooting 52.2% from the field. Leonard helped the Spurs to a 62–20 record – the number one seed in the NBA – and was named to the NBA All-Defensive Second Team for the first time. The Spurs and the Miami Heat met once again in the NBA Finals. On June 10, 2014, in Game 3 of the series, Leonard scored a then career-high 29 points in a 111–92 victory. San Antonio went on to win the series 4–1. Leonard averaged 17.8 points on 61% shooting and was named NBA Finals MVP. He was the third-youngest player to win the award (22 years and 351 days), behind only Magic Johnson—who won in both 1980 (20 years and 278 days) and 1982 (22 years and 298 days). Leonard was also only the sixth player, and the first since Chauncey Billups in 2004, to win Finals MVP in a season in which they were not an All-Star. After missing the final six preseason games and the season opener against the Dallas Mavericks due to an infection in his right eye caused by conjunctivitis, Leonard made his season debut against the Phoenix Suns on October 31 despite still suffering from blurry vision. He continued to play through the blurred vision and on November 10, 2014, he scored a season-high 26 points in the Spurs' 89–85 win over the Los Angeles Clippers. Following a three-game stint on the sidelines between December 17 and 20, Leonard had an injection in his injured right hand on December 22 and was ruled out indefinitely. He returned to action on January 16, 2015 after missing 15 games, recording 20 points, 4 rebounds, 5 assists and 3 steals to lead the Spurs to a 110–96 win over the Portland Trail Blazers. On April 5, Leonard recorded 26 points and a career-high 7 steals in a 107–92 win over the Golden State Warriors. On April 23, Leonard was named the NBA Defensive Player of the Year, joining Michael Jordan and Hakeem Olajuwon as the only players to win both NBA Defensive Player of the Year and NBA Finals MVP. The next day, he scored a playoff career-high 32 points in a Game 3 first-round playoff series victory over the Los Angeles Clippers. The Spurs went on to lose the series in seven games. On July 16, 2015, Leonard re-signed with the Spurs to a five-year, $90 million contract. On October 28, he scored a then career-high 32 points in a 112–106 season opening loss to the Oklahoma City Thunder. On December 3, he scored 27 points and made a career-high seven three-pointers in a 103–83 win over the Memphis Grizzlies. On January 21, 2016, he was named as a starter to the Western Conference team for the 2016 All-Star Game, earning his first All-Star selection and became the sixth Spurs player in franchise history to be selected as an All-Star starter, joining George Gervin, Larry Kenon, Alvin Robertson, David Robinson and Tim Duncan. On March 23, 2016, Leonard had another 32-point outing in a 112–88 win over the Miami Heat, helping the Spurs extend their franchise-record home winning streak to 45 games (dating to 2014–15 season). On April 2, he set a new career high with 33 points in a 102–95 win over the Toronto Raptors, helping the Spurs set a franchise record with their 64th victory. The Spurs topped their 63-win season in 2005–06 and extended their NBA-record home winning streak to start the season to 39 games. Leonard helped the Spurs finish second in the Western Conference with a 67–15 record, and earned Defensive Player of the Year honors for a second straight year, becoming the first non-center to earn the honor in back-to-back seasons since Dennis Rodman in 1989–90 and 1990–91. Additionally, he finished runner-up in the MVP voting behind Stephen Curry. In Game 3 of the Spurs' first-round playoff series with the Memphis Grizzlies, Leonard helped the Spurs go up 3–0 with a 32-point performance, tying his playoff career high. After sweeping the Grizzlies, the Spurs moved on to face the Oklahoma City Thunder in the second round. In Game 3 of the series against the Thunder, Leonard helped the Spurs go up 2–1 with 31 points and 11 rebounds. However, the Spurs went on to lose the next three games, bowing out of the playoffs with a 4–2 defeat. In the Spurs' season opener on October 25, 2016, Leonard recorded a career-high 35 points and five steals in a 129–100 win over the Golden State Warriors. On January 14, 2017, he set a new career high with 38 points in a 108–105 loss to the Phoenix Suns, becoming the first Spur to record three consecutive 30-point games since Tony Parker in 2012. On January 19, he was named a starter for the Western Conference All-Star team in the 2017 NBA All-Star Game and had 34 points against the Denver Nuggets for his fifth straight 30-point performance. Two days later, he set a new career high with 41 points in a 118–115 overtime win over the Cleveland Cavaliers, becoming the first San Antonio player to score at least 30 in six straight games since Mike Mitchell in 1986. He subsequently earned Western Conference Player of the Week honors for games played Monday, January 16 through Sunday, January 22. On February 13, 2017, Leonard made 13 of 23 shots including two three-pointers and finished with 32 points, six rebounds and four steals in a 110–106 win over the Indiana Pacers. It was his fifth straight 30-point game. With their 42nd victory of the season coming against the Pacers, the Spurs extended their streak of consecutive winning seasons to a league-record 20. On March 6, after being named Player of the Week for the fourth time in his career, Leonard scored 39 points to lead the Spurs to a 112–110 win over the Houston Rockets. It was his 91st straight game scoring in double figures, matching San Antonio's longest streak since Tim Duncan did so in 2002–03. On April 15, 2017, Leonard matched his postseason high with 32 points in a 111–82 victory over the Memphis Grizzlies in Game 1 of their first-round playoff series. Two days later, in Game 2, Leonard had a postseason career-high 37 points and added 11 rebounds in a 96–82 win over Memphis to take a 2–0 series lead. In Game 4 of the series in Memphis, Leonard had another postseason personal best with 43 points in a 110–108 overtime loss; the loss tied the series at 2–2. Behind a 29-point effort from Leonard in Game 6, the Spurs advanced to the Western Conference semifinals by beating Memphis 103–96 to take the series 4–2. The Spurs went on to advance to the Western Conference Finals with a 4–2 triumph over the Houston Rockets in the second round, despite playing without Leonard in Game 6 due to an ankle injury. In the third quarter of Game 1 of the Western Conference Finals against the Golden State Warriors, Leonard landed on Zaza Pachulia's foot after attempting a field goal and re-aggravated his existing ankle injury. He exited the game with 26 points and sat out the remainder of the series as the Spurs lost to the Warriors in four games. Leonard finished the season with averages of 25.5 points, 5.8 rebounds, 3.5 assists and 1.8 steals per game in the regular season, and 27.7 points, 7.8 rebounds, 4.6 assists and 1.7 steals for the playoffs. He was subsequently selected to the All-NBA First Team for the second time in his career, as well as earning All-Defensive First Team honors for the third time in three years. Leonard's 2017–18 season was overshadowed by an injury, and by ensuing disputes between Leonard and the Spurs regarding the handling of that injury. He missed the first 27 games of the season with a right quadriceps injury, making his season debut on December 12, 2017, against the Dallas Mavericks. On December 26, 2017, in just his fifth game of the season, Leonard scored a season-high 21 points on 8-of-17 shooting in a 109–97 win over the Brooklyn Nets. On January 2, 2018, he set a new season high with 25 points in a 100–91 win over the New York Knicks. Three days later, in a game against the Phoenix Suns, Leonard suffered a partial tear in his left shoulder. He returned to action on January 13 after missing three games and scored 19 points in a 112–80 win over the Denver Nuggets. Four days later, however, he was ruled out for an indefinite period of time to continue his rehabilitation process from right quadriceps tendinopathy. Leonard was subsequently cleared to play by the Spurs medical staff, but he solicited a second opinion from his own doctors. In March, the Spurs held a players-only meeting in which Leonard's teammates reportedly asked him to return to the court; the meeting was described as "tense and emotional". Leonard did not play again in 2018. In June 2018, reports surfaced claiming that Leonard had requested a trade from the Spurs; this followed months of allegations that there was growing tension between Leonard's camp and the Spurs stemming from a disagreement over his injury rehabilitation process. A month later, on July 18, Leonard and teammate Danny Green were traded to the Toronto Raptors in exchange for DeMar DeRozan, Jakob Pöltl and a protected 2019 first round draft pick. In his debut for the Raptors in their season opener on October 17, Leonard had 24 points and 12 rebounds in a 116–104 win over the Cleveland Cavaliers. Two days later, he had 31 points and 10 rebounds in a 113–101 win over the Boston Celtics. On October 24, he scored 35 points in a 112–105 win over the Minnesota Timberwolves, helping the Raptors start the season 5–0. On November 16, he recorded 31 points and a season-high 15 rebounds in a 123–116 overtime loss to the Celtics. On November 25, Leonard received the first regular season technical foul in his NBA career, while also recording 29 points and 12 rebounds in a 125–115 win over the Miami Heat. On November 29, he scored a season-high 37 points in a 131–128 overtime win over the Golden State Warriors. He was subsequently named Eastern Conference Player of the Week for games played November 26 – December 2. On December 21, he matched his season high with 37 points in a 126–110 win over the Cavaliers. On January 1, he scored a career-high 45 points in a 122–116 win over the Utah Jazz, thus scoring 20 or more points in a career-best 14 straight games. On January 13, he recorded 41 points and 11 rebounds in a season-high 45 minutes in a 140–138 double-overtime win over the Washington Wizards. On January 31 against the Milwaukee Bucks, Leonard's career-high 22-game streak of scoring at least 20 points ended when he had 16 points in a 105–92 loss. On March 1, he scored 38 points and made the go-ahead basket with three seconds remaining to lift the Raptors to a 119–117 win over the Portland Trail Blazers. Leonard is the son of Mark Leonard and Kim Robertson. He is the youngest child of the family and has four sisters. His father, Mark, was shot and killed on January 18, 2008, at the Compton car wash he owned. As of 2014[update], the murderer had still not been found, and the family had stopped asking authorities for updates. Leonard is the cousin of Stevie Johnson, American football wide receiver. According to Leonard, his great-great-great grandparents were from Cape Town, South Africa. Leonard's girlfriend, Kishele Shipley, gave birth to their first child in July 2016. In March 2019, the couple welcomed their second child, a boy. In 2018, Leonard reportedly signed a multi-year endorsement deal with New Balance. Leonard had been previously signed with Air Jordan brand, a subsidiary of Nike. Leonard is an intensely private individual who has publicly noted his dislike for the media. As such, he rarely participates in interviews and avoids questions pertaining to his private life. He is also not on social media. ^ Leung, Diamond (April 15, 2011). "SDSU loses Kawhi Leonard and his recruiter". ESPN. Retrieved December 21, 2011. ^ "Rivals.com". Retrieved February 16, 2017. ^ "Aztecs Win MWC Tournament, Automatic NCAA Bid". Retrieved February 16, 2017. ^ "Kawhi Leonard Stats". ESPN. Retrieved December 21, 2011. ^ Zeigler, Mark (March 12, 2011). "Aztecs beat BYU to win MWC Tournament". The San Diego Union-Tribune. Archived from the original on June 20, 2014. ^ Goodman, Jeff (March 7, 2011). "Goodman's 2010–11 All-America teams". Fox Sports. Fox Sports Interactive Media. Archived from the original on February 1, 2014. Retrieved June 21, 2011. ^ Greg Beacham (March 25, 2011). "Kemba Walker leads UConn past San Diego State". Associated Press. Retrieved December 21, 2011. ^ "NBA Draft trades: Pacers deal Leonard to San Antonio for George Hill". SportingNews.com. June 23, 2011. Archived from the original on May 29, 2013. Retrieved December 21, 2011. ^ "Spurs Sign Kawhi Leonard". NBA.com. December 10, 2011. Retrieved December 21, 2011. ^ "All-Star notebook: Calf strain keeps Leonard out of Rising Stars game". MySanAntonio.com. February 24, 2012. Retrieved February 24, 2012. ^ "Cavaliers' Kyrie Irving named Kia Rookie of the Year". NBA.com. May 15, 2012. Archived from the original on May 17, 2012. Retrieved May 15, 2012. ^ "San Antonio's Kawhi Leonard Named to NBA's All-Rookie First Team". NBA.com. May 22, 2012. Retrieved May 22, 2012. ^ Deveney, Sean (September 2, 2012). "Gregg Popovich: Kawhi Leonard will "be the face of the Spurs"". SportingNews.com. Retrieved September 2, 2012. 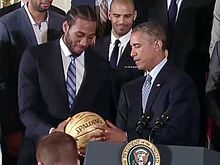 ^ "Kawhi Leonard and DeJuan Blair Chosen to 2012 USA Men's Select Team". NBA.com. May 21, 2012. Retrieved May 21, 2012. ^ "Spurs Exercise Team Options on Cory Joseph and Kawhi Leonard". NBA.com. October 26, 2012. Retrieved October 26, 2012. ^ "Kawhi Leonard Selected by Team Chuck for BBVA Rising Stars Challenge". NBA.com. February 7, 2013. Retrieved February 7, 2013. ^ "Team Shaq at Team Chuck". NBA.com. February 15, 2013. Retrieved February 15, 2013. ^ "Grizzlies at Spurs". Retrieved February 16, 2017. ^ "Kawhi Leonard Named to 2013-14 NBA All-Defensive Second Team". Retrieved February 16, 2017. ^ "Spurs at Heat". Retrieved February 16, 2017. ^ a b "Kawhi Leonard named Finals MVP". ESPN. Associated Press. June 16, 2014. Archived from the original on June 16, 2014. ^ "MVP Leonard does it all". ESPN. June 16, 2014. Archived from the original on June 16, 2014. ^ Martin, Brian (June 16, 2014). "Game 5 By The Numbers". NBA.com. Archived from the original on June 22, 2014. ^ "Kawhi Leonard available for Spurs". ESPN. October 30, 2014. Retrieved November 28, 2014. ^ "Leonard scores 26, Spurs rally past Clippers 89-85". NBA.com. November 10, 2014. Retrieved November 11, 2014. ^ "Kawhi Leonard gets hand injection". ESPN. December 22, 2014. Retrieved December 23, 2014. ^ "Leonard has 20 in return, powers Spurs past Blazers". NBA.com. January 16, 2015. Retrieved January 21, 2015. ^ "Warriors at Spurs". Retrieved February 16, 2017. ^ "Kawhi Leonard wins NBA Defensive Player of the Year". suntimes.com. April 23, 2015. Archived from the original on April 25, 2015. Retrieved April 23, 2015. ^ "Clippers at Spurs". Retrieved February 16, 2017. ^ "Spurs Re-Sign Kawhi Leonard". NBA.com. July 16, 2015. Retrieved July 16, 2015. ^ "Sources: Kawhi Leonard agrees to five-year, $90M deal to remain with Spurs". ESPN. July 1, 2015. Retrieved July 16, 2015. ^ "Spurs vs Thunder". Retrieved February 16, 2017. ^ "Spurs vs Grizzlies". Retrieved February 16, 2017. ^ "KAWHI LEONARD SELECTED AS STARTER FOR THE 2016 NBA ALL-STAR GAME". NBA.com. January 21, 2016. Retrieved January 22, 2016. ^ "Leonard matches career high with 32, Spurs beat Heat 112-88". NBA.com. March 23, 2016. Retrieved March 24, 2016. ^ "Aldridge, Leonard lead Spurs to franchise record 64th win". NBA.com. April 2, 2016. Retrieved April 3, 2016. ^ "KAWHI LEONARD WINS 2015-16 KIA NBA DEFENSIVE PLAYER OF THE YEAR AWARD". NBA.com. April 18, 2016. Retrieved April 18, 2016. ^ "Warriors' Curry wins second straight Kia MVP award". NBA.com. May 10, 2016. Retrieved May 10, 2016. ^ "Spurs take 3-0 series lead, beating ragtag Grizzlies 96-87". NBA.com. April 22, 2016. Retrieved April 22, 2016. ^ "Leonard's 31 help Spurs beat Thunder 100-96, take 2-1 lead". NBA.com. May 6, 2016. Retrieved May 6, 2016. ^ Wright, Michael C. (January 14, 2017). "Devin Booker and Kawhi Leonard wow sellout crowd in Mexico City". ESPN.com. Retrieved January 14, 2017. ^ "Leonard has 34, Spurs overcome Gasol's injury to top Nuggets". ESPN.com. January 19, 2017. Retrieved January 20, 2017. ^ "Leonard scores 41, Spurs down Cavaliers 118-115 in overtime". ESPN.com. January 21, 2017. Retrieved January 22, 2017. ^ "KAWHI LEONARD NAMED WESTERN CONFERENCE PLAYER OF THE WEEK". NBA.com. January 23, 2017. Retrieved January 23, 2017. ^ "Spurs top Pacers to clinch NBA-record 20th straight winning season". ESPN.com. February 13, 2017. Retrieved February 14, 2017. ^ "Leonard's 39 points, defense, lead Spurs by Harden, Rockets". ESPN.com. March 6, 2017. Retrieved March 7, 2017. ^ "Charlotte Hornets' Kemba Walker, San Antonio Spurs' Kawhi Leonard named Players of the Week". NBA.com. March 6, 2017. Retrieved March 7, 2017. ^ "Leonard has 32 points, Spurs rout Grizzlies 111-82 in Game 1". ESPN.com. April 15, 2017. Retrieved April 15, 2017. ^ "Leonard's 37 points lead Spurs by Grizzlies 96-82". ESPN.com. April 17, 2017. Retrieved April 18, 2017. ^ "Tied at 2: Gasol lifts Grizzlies past Spurs 110-108 in OT". ESPN.com. April 22, 2017. Retrieved April 23, 2017. ^ "Spurs advance: San Antonio beats Grizzlies 103-96 in Game 6". ESPN.com. April 27, 2017. Retrieved April 28, 2017. ^ "Russell Westbrook, James Harden, LeBron James lead 2016-17 All-NBA first team". NBA.com. May 18, 2017. Retrieved May 22, 2017. ^ "Leonard, Aldridge lead healthy Spurs past Nets, 109-97". ESPN.com. December 26, 2017. Retrieved December 26, 2017. ^ "Spurs beat Knicks, Popovich alone in 5th for coaching wins". ESPN.com. January 2, 2018. Retrieved January 2, 2018. ^ "Spurs' Gregg Popovich says Kawhi Leonard is dealing with a partial tear in shoulder". CBSSports.com. Retrieved January 8, 2018. ^ reports, From NBA Twitter and media. "San Antonio Spurs coach Gregg Popovich says forward Kawhi Leonard suffered tear in shoulder". NBA.com. Retrieved January 8, 2018. ^ "Leonard, Bertans lead Spurs to 112-80 win over Denver". ESPN.com. January 13, 2018. Retrieved January 14, 2018. ^ "Newcomer Kawhi Leonard scores 24 as Raptors beat Cavaliers". ESPN.com. October 17, 2018. Retrieved October 17, 2018. ^ "Leonard scores 35, Raptors beat Wolves 112-105 to reach 5-0". ESPN.com. October 24, 2018. Retrieved October 24, 2018. ^ Baer, Jack (November 25, 2018). "Kawhi Leonard loses his cool, picks up first regular season technical foul of his career". Yahoo! Sports. Retrieved November 26, 2018. ^ "Kawhi Leonard Named Eastern Conference Player of the Week". NBA.com. December 3, 2018. Retrieved December 3, 2018. ^ "Leonard scores 37 as Raptors beat Cavs 126-110". ESPN.com. December 21, 2018. Retrieved December 22, 2018. ^ "Leonard scores career-high 45, Raptors beat Jazz 122-116". ESPN.com. January 1, 2019. Retrieved January 2, 2019. ^ "Ibaka's 3-pointer helps Raptors survive Wizards in double OT". ESPN.com. January 13, 2019. Retrieved January 13, 2019. ^ "Antetokounmpo scores 19, Bucks beat Raptors 105-92". ESPN.com. January 31, 2019. Retrieved February 1, 2019. ^ "Leonard hits winner, Raptors beat Trail Blazers 119-117". ESPN.com. March 1, 2019. Retrieved March 2, 2019. ^ "The Island of Kawhi: Leonard gives second wind to Spurs' dynasty". Sports Illustrated. March 14, 2016. Retrieved August 21, 2017. ^ Eric Sondheimer (March 8, 2008). "Shooting death of his father drives Riverside King's Leonard". Los Angeles Times. Retrieved December 21, 2011. ^ "If Spurs Clinch On Sunday, It Will Be Bittersweet For Kawhi Leonard". June 13, 2014. Retrieved February 16, 2017. ^ Powell, Shaun (October 21, 2013). "The Spurs' Kawhi Leonard is ready to break out". Retrieved February 16, 2017. ^ Henne, Ricky (August 3, 2015). "The Lightning Report". chargers.com. Retrieved August 3, 2015. ^ McCarney, Dan (August 18, 2014). "Kawhi Leonard, a man after Matt Bonner's heart". mysanantonio.com. Retrieved August 18, 2014. ^ "The real Kawhi Leonard: How Hungry Are You?". Serge Ibaka YouTube channel. April 11, 2019. Retrieved April 12, 2019. ^ "The tight arse worth a cool $94 million". Retrieved February 16, 2017. ^ "Kawhi Leonard expecting birth of first child this summer". Retrieved February 16, 2017. ^ "Kawhi Leonard Missed Game In Chicago Due To His Wife Giving Birth To Their Second Child". NBA News Rumors Trades Stats Free Agency. April 1, 2019. Retrieved April 1, 2019. ^ Haynes, Chris (November 28, 2018). "Sources: Kawhi Leonard agrees to endorsement deal with New Balance". Yahoo! Sports. Retrieved November 28, 2018. ^ Loung, Steven (December 11, 2018). "Raptors' Kawhi Leonard doesn't want to talk about Christmas right now". www.sportsnet.ca. Retrieved December 21, 2018. ^ Abrams, Jonathan (April 4, 2017). "The Making of Kawhi Leonard, the Silent Superstar". Bleacher Report. Retrieved December 21, 2018. ^ Wiggins, Brandon (July 24, 2018). "Spurs legend David Robinson can 'count on one hand' the number of words Kawhi Leonard has spoken to him". Business Insider. Retrieved December 21, 2018. ^ "Raptors' Kawhi Leonard on laugh reaction: 'I don't have social media'". www.sportsnet.ca. October 2, 2018. Retrieved December 21, 2018. Wikimedia Commons has media related to Kawhi Leonard.